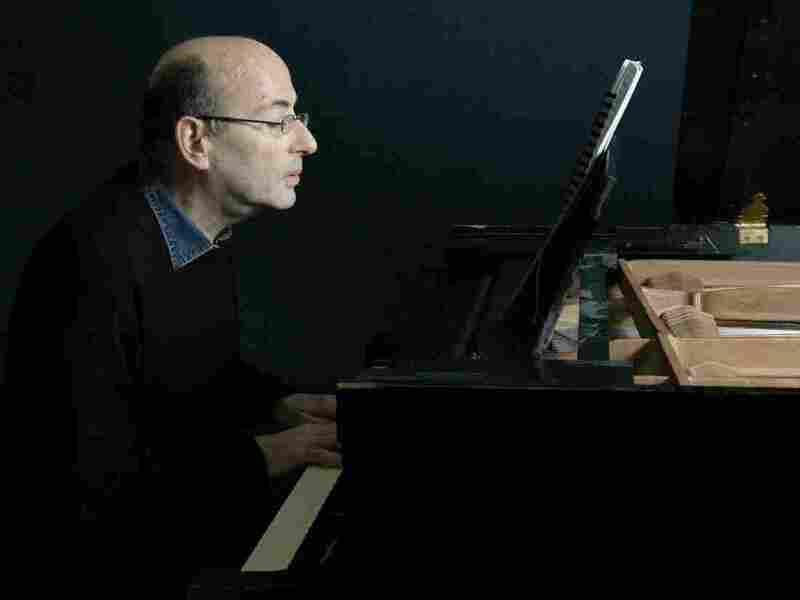 Composer Richard Einhorn lost most of his hearing several years ago, but that hasn't held him back, thanks to state-of-the-art digital hearing aids. One day in the fall of 2010, composer Richard Einhorn woke up and realized there was something horribly wrong with his hearing. "There was an enormous, violent buzzing in my ears," he says. "And I realized that my right ear had gone completely deaf." Einhorn, who lives in New York, was experiencing a rare problem called sudden deafness. He would never recover any useful hearing in his right ear because of a problem called hyperacusis, which makes even ordinary sounds intolerable. "Speech sounds like the worst science-fiction robot screaming in your ear," he says. "It's a shrieking, horrible, hideous metallic sound." So Einhorn has to wear an ear plug in his right ear much of the time. He's created his own audio demos to give others a sense of what hyperacusis can be like. First, listen to Einhorn reading an early 19th-century quote from Ludwig van Beethoven, bemoaning his own increasing deafness. Next, listen to the way Einhorn's hyperacusis distorts the same quote. Unlike his right ear, Einhorn's left ear did get better, though unamplified sounds remain very faint. It's been a big change for a man whose ears weren't just good, they were golden. "I was the kind of person who would walk into a space, clap my hands once and be able to decide whether or not I could record a symphony orchestra there and have it sound good," he says. After losing so much of his hearing, Einhorn says, he wasn't sure whether he would still be able to work as a composer. So he began investing in technology that could help him make the most of the hearing he had left. Einhorn bought a top-of-the-line digital hearing aid for his left ear. He also went on to buy devices that help him hear what he's composing, talk on the phone, listen to live music, and carry on conversations in noisy restaurants. The solutions aren't perfect, Einhorn says. But they're pretty good. "I compose every day. I see my friends. I go to movies. I go to concerts. I do everything," he says. All that would have been a lot harder if Einhorn had lost his hearing just a couple of decades ago. Back then, most hearing aids were still analog devices with severe limitations. But in the digital age, hearing aids and so-called assistive listening devices have become smaller, smarter and much more powerful. The history of digital hearing aids goes back to the 1980s, says Matthew Bakke, a scientist at Gallaudet University who also directs the government's Rehabilitation Engineering Research Center on Hearing Enhancement. Bakke recalls helping to build a device that was "the size of a refrigerator." But like all things digital, it shrank fast. By the 1990s, digital hearing aids had gotten small enough to wear behind the ear. And they've at least mitigated many of the problems that plagued earlier devices, Bakke says. "In the old days, with an analog hearing aid, if something got too loud you got distortion," Bakke says. Not anymore. Digital sound processing also has cut down on the annoying squawks caused by feedback. And modern hearing aids are programmed to amplify only those sound frequencies a person has trouble hearing. The latest units even know which direction a sound is coming from, Bakke says. "Typically, there is a bubble of amplification in front of you and some suppression behind you," which mimics what our own ears do, Bakke says. Features like directional listening are possible because today's hearing aids are controlled by tiny computers that analyze and manipulate sound. This allows them to do things like reduce the drone of an air conditioner while amplifying speech sounds. Larry Medwetsky, an audiologist at Gallaudet, lost most of his hearing when he was 3. He didn't get hearing aids until he was 13. And they were the analog type. Medwetsky says these old-style hearing aids helped in quiet rooms. But when things got noisy, he had to turn them off. And he says they didn't amplify the full spectrum of audible sound. These days, Medwetsky's modern hearing aids do a much better job of reproducing sounds like music. "I'm able to hear the instruments better," he says. "I'm hearing a richness that I never heard before." Medwetsky's hearing aids have ear molds that completely fill the ear canal. That's the best solution for people like him who have hearing loss that affects the entire range of sound frequencies. But most people with age-related hearing loss only need to boost high frequency sounds. And they can use newer, so-called open-fit hearing aids that leave much of the ear canal open. The openness allows low-frequency sounds to enter the ear naturally, Medwetsky says. It also prevents sounds from getting trapped in the ear canal. One of the big reasons people returned hearing aids in the past, Medwetsky says, is that they did not like how their own voice sounded — as though it were coming from inside a barrel. That's not a problem with open-fit devices. "So this is a technology that has made a tremendous difference," Medwetsky says, "and it's become now the prominent type of hearing aid style." Other hearing aid advances include units that can receive Bluetooth audio from a cellphone and waterproof devices that can be worn while swimming. Also, miniaturization has led to units that may fit entirely within the ear or even disappear into the ear canal. But hearing aids still have their limitations. Einhorn, the composer, says he misses the subtle everyday sounds he used to find comforting — sounds like the swish of a towel landing in a laundry hamper. "When I do hear them through a hearing aid, they sound harsh and they sound tinny rather than comforting," he says. And hearing aids still don't work well in every environment. "We have huge expectations that hearing aids will solve all our hearing problems," Einhorn says. "But for specific situations, like restaurant listening, like listening in a classroom to your teacher, hearing aids need to be augmented with additional devices." These devices include separate microphones that can be placed close to the source of a sound. Einhorn says the problem with the microphones on hearing aids is that they are often too far away, so background noise drowns out what you are trying to hear. He's made a recording to demonstrate the problem this causes when he's trying to have a conversation in a noisy place. The woman you can just barely hear in this recording is Dana Mulvany, who often writes about the challenges faced by people who are hard of hearing. One solution he's found for noisy environments is a smartphone app that uses the phone's microphone to capture and deliver amplified, focused sound to high-quality headphones. When Einhorn has lunch with a group of friends he often uses an even better, though more expensive, solution. He gives each of them a special microphone to wear around the neck. Those microphones are linked wirelessly to a device that blends the voices and sends the sound to his good ear. But that sort of technology can't help in other situations, like when he's trying to hear directions above a subway's din from a booth attendant sitting inside the booth. Fortunately, New York subway booths have started using an old technology known as a loop system. It takes sound from a microphone inside the booth and beams it to a receiver called a telecoil, or "t-coil," that's found in most hearing aids. T-coil technology is also available in some theaters. Einhorn says the first time he tried it was during a performance of the musical Wicked. At previous musical performances, he'd tried listening the usual way through his hearing aids and the result had been painfully bad. "So, basically, I was expecting to have a miserable time and instead I was absolutely enthralled," he says. "It was simply the first time in over a year that I'd been able to enjoy a live musical performance and I was reduced to tears." T-coils can also help with cellphone calls, but only if you choose the right cellphone, says Kristin Roush, an audiologist at Gallaudet. The Federal Communications Commission requires cellphone makers to indicate whether a particular phone is compatible with hearing aids and whether it works with t-coils, she says. One thing technology can't overcome is people's reluctance to use hearing aids, Roush says. Many people still see the devices as an unwelcome sign that they are getting older or less able, she says. But as hearing aids have gotten smaller and able to do more things, Roush says, the stigma has diminished. "I see a lot of people coming in now that are just really looking for ... the best they can have," she says. The best doesn't come cheap, though. State-of-the-art hearing aids can cost $3,000 each.